Not more than a half hour drive from Jerusalem and you find yourself in an arid, biblical landscape with a view all the way to the Dead Sea. Looking back you can see the ridge of the Mount of Olives east of Jerusalem with 3 landmark towers jutting above the horizon, the steeple of the Russian Orthodox Church of the Ascension, the bell tower of Augusta Victoria and the tower on the Hebrew University campus. You can read my first blog post in the Times of Israel about Jerusalem landmarks at http://blogs.timesofisrael.com/jerusalem-landmarks-montefiore-to-calatrava/. Herodium is one of my favorite archaeological sites and when I guide we focus on the palace/fortress complex built by King Herod in about 20 BCE. But that is not to say that it’s not worth looking up and taking in the incredible view, a great place for taking photographs. Clicking on the image will display it larger. Please share this post with your friends by clicking on the icons at the end of this message. The technical details, shot with a Nikon DSLR camera, ISO 200, 31mm, F10 at 1/400 sec. This entry was posted in Desert, Nature, Photography and tagged Herodion, Israel photo, landmark, landscape photography, tower on October 3, 2014 by Shmuel Browns. Another photo of an archaeological site, one of my favorites, not far from Jerusalem. Many tours of Herodium take you straight to the park skipping the area of Lower Herodium that was excavated by Prof. Ehud Netzer ז”ל in 1970s. 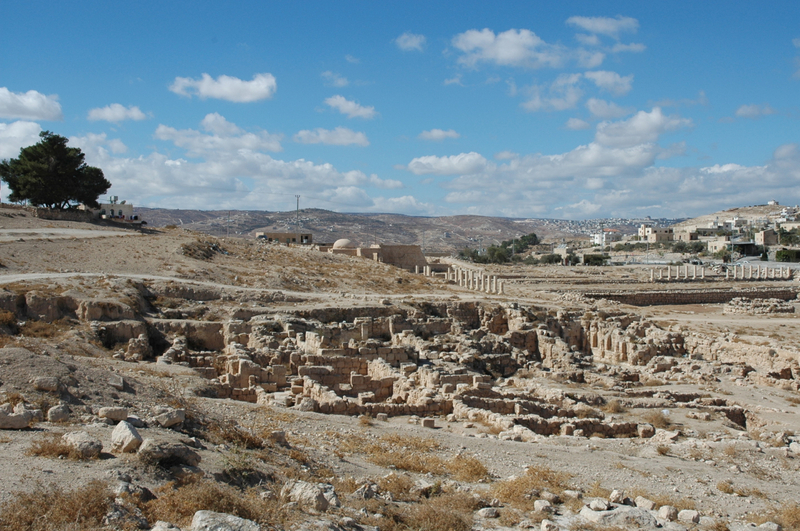 Here you can see the remains of the Monumental building – was this structure built as King Herod’s final resting place? Take a guided tour with me to find out. You can click on the image for a larger view (which may take some time to load depending on your Internet connection). Please share this post with your friends by clicking on the icons at the end of this message. The technical details – the photo was taken with a Nikon D70 digital SLR camera on November 2 (ISO 200, 25mm, F10 at 1/400 sec). FYI, the Israel Museum has announced that the exhibit on the latest finds at Herodium, including sarcophagi and secco wall paintings from the loggia of the theater will open February 2013. This entry was posted in Archaeology, Architecture, Photography and tagged archaeological park, ehud netzer, Herodion, Herodium, Israel photo, photo of week, Photography on November 4, 2012 by Shmuel Browns. Concepts of rootedness and disconnection which mark the complex relation of our civilization with the earth are central to the world of oppositions manifested in the sculpture’s plastic form. Olive trees, ancient symbol of strength, fertility and peace, continue their life in a transplanted and disconnected state. The park lies at an elevated and windy location overlooking Jerusalem and Bethlehem with views over the Judean desert, Herodium and as far as the Dead Sea. In preparing the park, mature olive trees were transplanted in 1987 from the experimental orchard of Prof. Shimon Lavee of the Vulcani Institute in Rehovot. Besides various types of olives that grow in Israel, there are olive trees that originate from Greece, Italy, Spain, France, Turkey, Algeria, Morocco, Argentina and the USA. In the center of the park is a structure of 3 steel columns covered with basalt stone aggregate that form a triangle, sitting on a stepped platform of concrete and Jerusalem boulders. On the top of the columns, 11 meters in the air, three 80 year old olive trees are growing, supported by a customized drip irrigation system. Part of the artistic project deals with the properties and spiritual harmonies of the number three: 3 monotheistic religions, 3 forefathers of the Jewish people, 3 Magi who came to visit Jesus, etc. 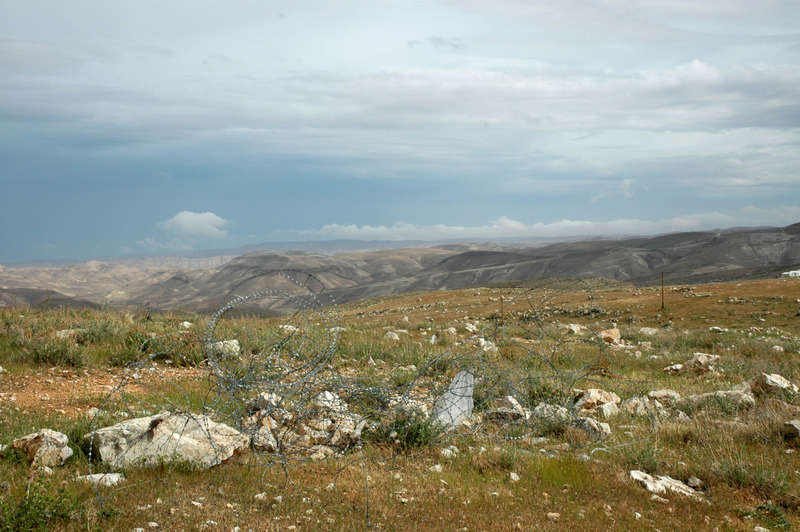 The location at the edge of the desert and near a blood-stained political border connects the different elements in its surroundings and relates to more ancient periods when olive trees and plowed earth were characteristic of man’s intervention in this arid landscape. Yerushalayim shel maala, heavenly Jerusalem. If we could only bring it down to earth. 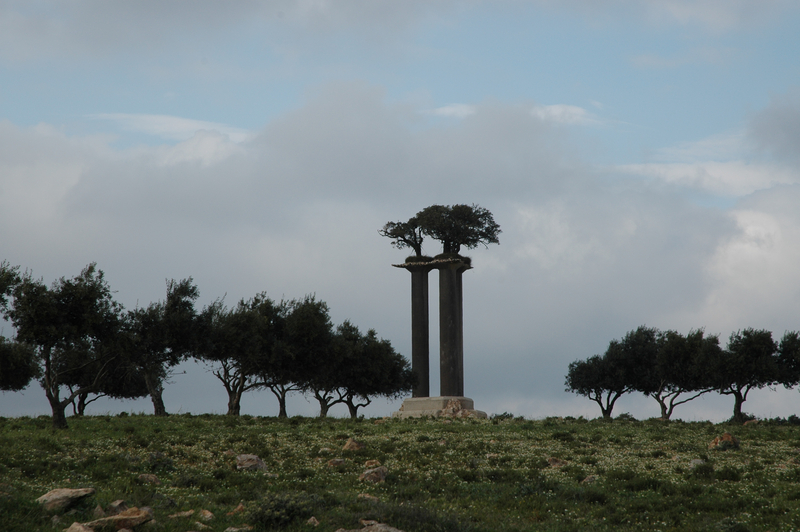 This entry was posted in Architecture, Art, Jerusalem, Nature, Water and tagged borders, desert, ecology, environment, Herodion, olive tree, politics, Ran Morin, rootedness, roots, sculpture, tree sculpture on November 17, 2010 by Shmuel Browns. I’m a tour guide who often does tours at Herodium, the palace complex built by King Herod about 15 km south of Jerusalem and where, according to Josephus, Herod was buried. Ehud Netzer, in excavating Lower Herodium, described a building that he called the Monumental building at the end of of an elongated course. He suggested that the building could have been Herod’s burial place. Since then Netzer has discovered the base of a mausoleum with finely carved decorations and 2 sarcophagi on the north-western side of the hill. There’s a diagram of the Canopus/Serapeum complex, an open air triclinium/nymphaeum and water course. This is very reminiscent of the Monumental building and course that Netzer describes (course at Lower Herodium is ~300m in length and ~25m wide). 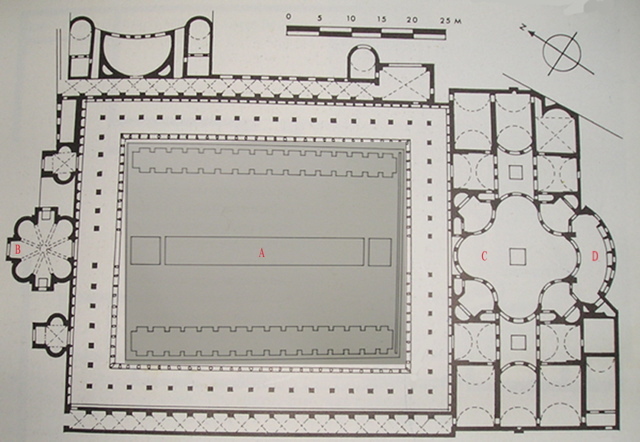 There is another nymphaeum in the plan, in the area called the Piazza d’Oro (based on Figure 103 on p. 177 of Sear’s Roman Architecture; the central dark grey area comes from Figure 114 on p. 96 of Macdonald and Pinto’s Hadrian’s Villa and its Legacy). (A) A large colonaded pool with garden. (B) The octagonal entrance vestibule. (C) The eight-sided space on the southeastern side of the courtyard. (D) The nymphaeum with five niches for fountains of flowing water. The article includes a photo of the remains of this nymphaeum, made up of 6 niches (which would have held the fountains) separated by pilasters. 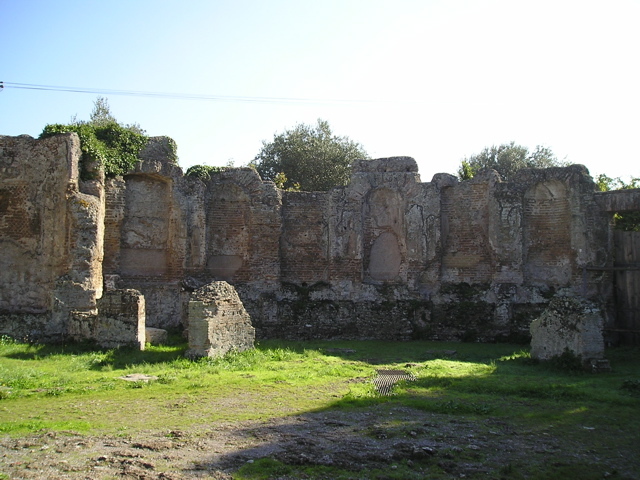 There is a channel that would have allowed water to run from the nymphaeum to the pool in the courtyard. I was struck by how similar this is to the Monumental building, so I have included a photo of it here. In guiding, I’ve had a number of tourists ask me what the curved cuts in the stone in the lower part of the pilasters (between the niches along the walls, 2 in the end, 3 on each side) were used for. If this was designed as a nymphaeum (either in the time of Herod or by later Roman governors) perhaps the channels were used for water. The course and building are just south of the large pool. This entry was posted in Archaeology, Architecture, Water and tagged architecture, Herod, Herodion, King Herod, lower Herodium, mausoleum, Netzer, nymphaeum, Tomb, water, water fountain on November 11, 2010 by Shmuel Browns. I’m happy when people contact me looking for a multi-day itinerary based from Jerusalem. It’s definitely worth a few days if you have the time. I’d like to share one itinerary that I guided for clients a couple of weeks ago. Of course, this itinerary is just to give you the idea – when you hire me as your guide you get a personalized itinerary that matches your interests. We started with an overview of Jerusalem from the promenade at Armon HaNatziv, learned about the aquaduct that brought water to the city from Hasmonean times (100 BCE). From there we drove to Herodium for a comprehensive tour: the lower city (pool, Roman bath, monumental building, Byzantine church) outside the park and the palace/fortress on the manmade mountain top built by King Herod including the latest excavation by Netzer of the tomb and Roman theater discovered on the north-east side of the mountain. Visit to Gush Etzion (Etzion Bloc) to learn about the history of the Gush and memorial to the defenders of Kibbutz Kfar Etzion in 1948. Lunch at a lovely restaurant called Gavna in the forest of Kibbutz Massuot Yitzhak with a view all the way to the coastal plain. Visit to Hebron and the Cave of Machpela, that Abraham purchased to bury Sarah in which our forefathers and 3/4 mothers are buried. The building over the cave was built by Herod. Walk around the city to try to understand the current political reality. Walking tour of the Old City covering the 4 quarters, the 3 religions and 3000 years of history, including Herodian, Roman, Byzantine, Arab, Crusader periods. Views of the city from above and exploring underground. Tastes of the city for lunch. Visit the Israel museum to see the 2nd Temple model of Jerusalem. Tour of the Shrine of the Book, the unique architecture, the exhibits of artifacts from Qumran and the Dead Sea Scrolls. Opportunity to stroll through the Sculpture garden. Visit the City of David, the walled Jebusite city captured by King David in 1004BCE and made the capital of his kingdom. Learn about the extensive archaeology going on there and the politics. Possibility of walking through Hezekiah’s tunnel. Drive from Jerusalem to the Dead Sea and Judean desert, the lowest point on earth, only 42 km away but 1170 meters lower. Learn about the African Rift valley, water, shrinking of Dead Sea, sink-holes, flora and fauna. Qumran where the Dead Sea Scrolls were discovered in passing. At Ein Gedi, hike Nahal David to waterfalls and natural pools (it’s delightful to take a dip even in the winter months). Visit the ruins of the Jewish synagogue with mosaic floor. Continue south to Masada, Hasmonean fortress in the desert extensively renovated by Herod, used by the Jewish rebels against the Roman and later by some Byzantine monks. Visit the new museum at Masada. This entry was posted in Archaeology, Itinerary, Jerusalem, Tomb, Travel, Water and tagged archaeological tour, Christianity, Herod, Herodion, history tour, itinerary, Jerusalem, Judaism, King Herod, religion, walking tour on January 23, 2010 by Shmuel Browns. So they went eight furlongs to Herodium; for there by his own command he was to be buried. And thus did Herod end his life. In 1972 Professor Ehud Netzer began his excavations at Lower Herodium. In May 2007 after 35 years of looking for King Herod’s tomb at Herodium, Netzer announced at a press conference that he had uncovered the base of Herod’s mausoleum halfway up the manmade mountain, on the northeast side. Netzer, both an architect and archaeologist and an expert in the Herodian period, has drawn up his reconstruction of the mausoleum, a monument 25 meters high, with a cube-shaped first floor, a cylindrical second floor and a soaring, peaked roof. Note that the photo below is of Yad Avshalom in the Kidron valley – it is an impressive nefesh from the same period so it’s likely that Herod’s monument could have looked similar. I’d be delighted to guide you at the site, including the palace complex at the foot of the hill excavated by Netzer in the 1970s and the palace-fortress at the top (in the archaeological park) built by Herod. Although the tomb area is not yet open to the public, they’ve made a temporary path that takes you close, to a lookout of the remains of the mausoleum. Excavations are continuing. Discovered was an ornate, pink limestone sarcophagus that had been smashed to pieces in antiquity that Netzer claims was King Herod’s. Later two other sarcophagi were discovered that Netzer claims belong to other members of Herod’s family. Herodium is unique among the sites like Masada, Caesarea, Cypros associated with Herod – it was an entire palace complex originally built by Herod in the desert, the only site to bear his name and where he decided to be buried. Herodium gives us a key to understanding Herod and Jewish life during the Second Temple period. This entry was posted in Archaeology, Tomb and tagged Herodion on March 25, 2009 by Shmuel Browns. A guided tour of an archaeological site like Herodium can be a unique birthday present for a friend or family member. It was a hot and sunny day but there was a cool breeze on the mountaintop and you could understand one reason why Herod would have chosen this site. When I guide Herodium I often start in the Old City to show people the remains of the buildings at the Wohl museum and the stones of the walls and streets from the Herodion period along the western wall below Robinson’s Arch. Also, the Herodion stones forming the base of the tower at the Roman Gate are impressive. Seeing examples of Herod’s architecture help people know what to look for when we get to Herodium. Last summer, I participated for a few days in the latest excavations that Ehud Netzer is leading on the eastern side of the mountain, excavating the tomb area. We were working on the pool and besides many pottery shards we found some catapult stones (size of snowballs, not to be confused with the larger ones rolled down from the walls by the Jewish rebels) and some coins from the Great Revolt. Excavations are continuing and they’ve excavated a much larger area now. More of the base of the mausoleum is now exposed. Additional stone architectural details of a very high quality can be seen. These are not of the local soft limestone but a more royal stone, called meleke, that would have been quarried some distance away and brought here. Netzer thinks that the base supported a nefesh or monument, cylindrical in shape, something like Yad Avshalom in the Kidron Valley. The latest findings are changing our understanding of Herodium. For example, it seems that the earth that was piled up around the mountain palace/fortress is not from the time of Herod but later. Originally, there was a glacis, a sloping wall, that circumvented the mountain. Also, the archaeological evidence suggests that the staircase that is described by Josephus “and provided an easy ascent by two hundred steps of the purest white marble” was built later, that originally there was a “snake path” like at Masada. Archaeologists are left with some interesting unanswered questions: When was it done, why and by whom? 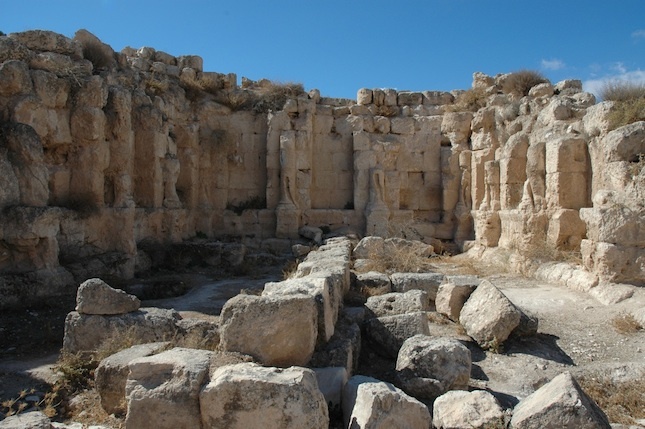 This entry was posted in Archaeology and tagged Great Revolt, Herod, Herodion, Judean desert, synagogue, Tomb, water systems on June 7, 2008 by Shmuel Browns.